Vail Mountain in the summer (Vail Resorts photo). 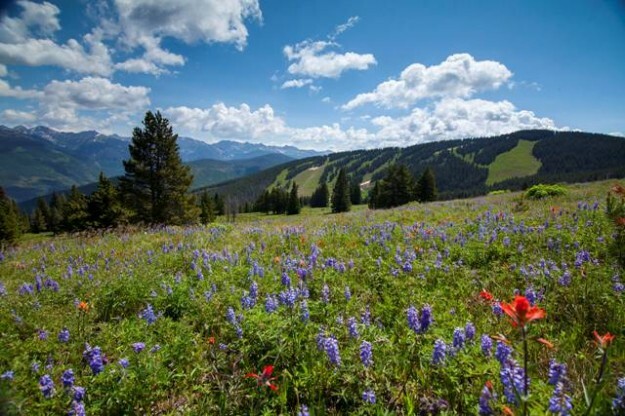 State lawmakers from Colorado’s mountain communities battled hard for a variety of bills in the first two weeks of the current legislative session, pushing for everything from a “Public Lands Day” holiday to a traction bill on Interstate 70 to more money for K-12 education. In the Senate, Vail Democrat Kerry Donovan saw the State, Veterans, and Military Affairs Committee — typically a kill committee in the Republican-controlled Senate — vote to lay over her bill recognizing the importance of public lands to Colorado’s way of life and economy. A layover is when a committee opts to delay judgment on legislation — a method of killing legislation in the past through indefinite delays. Wednesday saw testimony in support of Senate Bill 16-021 from a diverse group of constituents, ranging from Colorado Bowhunters and the Patriot Anglers to Backcountry United and Environmental Learning for Kids. “While I am disappointed this bill wasn’t immediately passed, I am hopeful that with a layover this early in the session, my Republican colleagues will join me and the vast majority of Coloradans, who support celebrating our public lands, by considering this bill in the coming days,” Donovan said, pointing to the economic benefits to rural mountain communities stemming from the state’s $18 billion tourism industry. Conservation Colorado Executive Director Pete Maysmith pointed to the extreme rhetoric swirling around the topic in recent years and headlines across the West questioning federal management of public lands. “At a time when the debate is so heated on public lands around the West, this bill shows the Colorado way is to come together and celebrate our public lands. We call on the committee and the Colorado Assembly to act promptly to pass SB-21 and designate Colorado Public Lands Day,” Maysmith said. On the transportation front, state Rep. Diane Mitsch Bush’s campaign to protect public safety on the mountain corridor of Interstate 70 cleared its first legislative hurdle Wednesday with a bipartisan 9-4 vote in the House Transportation & Energy Committee. HB16-1039, also sponsored by Rep. Bob Rankin, R-Carbondale and endorsed by the bipartisan Transportation Legislation Review Committee, states that motorists must have adequate tires, or chains or alternate traction devices on their vehicles from October 1 to May 15 between Dotsero and Morrison on I-70. Every year, the I-70 mountain corridor shuts down repeatedly because drivers with worn tires spin out or simply lose traction, blocking snow- or ice-covered lanes. Vail Police Chief Dwight Henninger testified that without this bill, public safety risks multiply for other drivers, for law enforcement and ambulances. Eagle County Paramedic Director Chris Montera testified about an incident in which an ambulance was stuck behind spun-out vehicles for six hours in transit to a Front Range hospital. In addition to the risk to public safety, the state suffers an estimated $800,000 economic loss for every hour that I-70 is closed, making Coloradans late for work and giving stuck-in-traffic visitors plenty of time to think about heading to some other state for their next ski vacation. The bill now goes to the House floor. The Joint Budget Committee, chaired by Rep. Millie Hamner, D-Dillon, boosted education funding by $24.5 million in the current budget year and created a pathway for more sustainable funding for K-12 education in future years. The Colorado school finance formula sets statewide funding levels for schools, which are met through a mixture of local property tax dollars and state funds. New information was presented to the JBC today showing lower-than-expected student enrollment, higher-than-expected local assessed property values and falling mineral lease revenues from declining oil and gas activity. The net result: an opportunity to reduce the “negative factor” and immediately increase per-pupil funding to schools. Instead of cutting $24.5 million from student enrollment-based distributions to school districts, the JBC decided to reinvest that savings back into the K-12 funding formula, increasing per-pupil funding by $18 and reducing the “negative factor” for the current budget year. The committee members also set a goal to keep the negative factor flat for the upcoming budget year. They intend to hold the revenue from higher local assessed property values to fill the education funding gap that we are facing in 2016-17, and ultimately chart a course towards more sustainable K-12 education funding in the future. This will help districts create their own budgets with more predictability and more revenue, allowing them to make long-term investments in quality teachers and learning experiences for students.